Mint Srixon Z U85 3 Iron 20 S Flex. Shipped with USPS Priority Mail. The club as a Factory installed KBS Tour FLT - Stiff flex Steel shaft and has a Taylormade grip. Standard Specs. 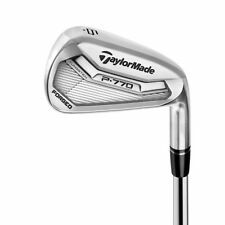 TAYLORMADE P 770. Shaft Flex: Stiff. Manufacturer: Cobra. Shaft Material: Steel. Dallas Golf wants to buy your used clubs! Want to know how it works?. 7.0 out of 10.0 = In fair, but perfectly playable, condition. Shows modest to more significant signs of use, which may include scuffs and scratches to the face, slightly worn grooves, a worn grip, paint blemishes on the crown, or other signs of use through the normal course of play. A used but in excellent condition TaylorMade SpeedBlade 3 iron with a stiff graphite Diamana S 82HY shaft, club is 39" and makes a great driving iron. This is a set of RH TaylorMade Burner Midsize irons 3- 9 PW. Irons with TM Dynamic Gold steel shafts Stiff. TaylorMade Burner 2.0. Regular Flex Steel Shaft. Shaft is the REAX 55 GRAPHITE A (SENIOR) Flex. Taylormade Grip. New condition (see Grading Definition below ). Alaska, APO, Hawaii, and Puerto Rico Residents. Taylormade Grip. Length = Standard. New condition (see Grading Definition below ). Alaska, APO, Hawaii, and Puerto Rico Residents. The irons are all Standard length, lie and loft. CALLAWAY RAZR X BLACK SINGLE 6 IRON. RAZR Technology shifts the center of gravity lower and deeper by redistributing weight in the back cavity; providing the power and forgiveness of a wide-sole iron with the precision and playability of a thin-sole iron. P730 7 iron single. Condition is Used. 9/10 Mint condition May have hit one or two balls. Shaft Material: ST Loft: 7. Grip Vendor: GolfPride. Shaft Flex: 6.0. NICE Karsten Golf PING EYE 2 PLUS Orange Dot 2 IRON Driving Iron. Right Steel ping KT Shaft Extra Stiff. Condition is Used. Shipped with USPS Priority Mail. Callaway Apex CF16 Forged 4-Iron XP 105 Stiff Flex Steel RH. Condition is like new. Maybe hit 10-15 times total and then stored. Shipped with USPS Priority Mail. SUPER PROTO DHY Hybrid/Iron Head. 16 Degrees. New condition (see Grading Definition below). Cobra AMP Single 4 Iron Rh Stock shaft and grip Please review pics for details Thanks Also have the G wedge listed !! Shaft is the KURO KAGE 80 STIFF Flex. Taylormade Grip. New condition (see Grading Definition below ). Right Handed. Alaska, APO, Hawaii, and Puerto Rico Residents. Women’s Adams Idea a705 7 Hybrid/Iron RH w/ Grafalloy 50g Graphite Shaft. Condition is Good. Shipped with USPS Priority Mail. Titleist 718 T-MB 3 iron with KBS Tour 90 regular flex shaft. Standard length and lie. Loft is 1 degree strong (19 instead of standard 20 ). Standard Golf Pride 360 Tour Velvet grip. This is a great club but the lightweight shaft doesn't match with my other irons. New ListingCallaway Apex Pro Forged 6 Iron Regular Flex R300 Steel "FROM A SET" EXCELLENT!! THIS IS A GREAT CLUB FOR THE MONEY! 4.5 out of 5 stars - Callaway Apex Pro Forged 6 Iron Regular Flex R300 Steel "FROM A SET" EXCELLENT!! 19 product ratings19 product ratings - Callaway Apex Pro Forged 6 Iron Regular Flex R300 Steel "FROM A SET" EXCELLENT!! Ping i3 Blade Green Dot Single 7 Iron RH w/ Ping Cushin JZ Stiff Steel Shaft. Condition is Used. Shipped with USPS Priority Mail. Shaft: KBS Tour C-Taper 120 Stiff. Grip: Factory Installed Mizuno M31 - Std Size. New ListingTaylormade P790 3 Iron - s300 shaft Great Condition. Taylormade P790 3 Iron - s300 shaft Great Condition.. Condition is Used. Shipped with USPS Priority Mail. Stainless Steel Head 6 Iron. Wilson Rubber Grip. Used RH Titleist DCI 981 Single 2 Iron Titleist Steel Stiff Flex - EXCELLENT! Mizuno JPX 919 Tour Forged 4 Iron Stiff Flex DG S300 120 Steel NEW IN PLASTIC! !